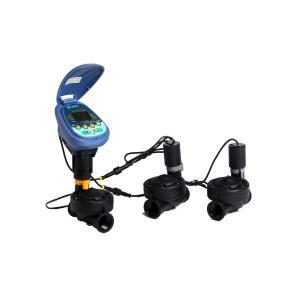 This Three Zone Controller with 3/4" Valves operates three stations and programming can be set for standalone or sequential operation. No difficult wiring necessary with this controller; fast, waterproof EZ connectors are used to connect this controller to DC valve solenoids. This three-zone controller comes with three DC valves and the timer. Please Note: PVC parts shown in second image are for reference only and not included.